Ben is a famous horror film composer, but his divorce has left him in a rut he can’t seem to shake, so his partner Eddie decides what Ben needs is a month-long stay on a haunted island named The Sorrows. When the two men and the women staying with them arrive, they begin to realize that the island’s grisly, murderous past might not be over yet. After reading The Siren and the Specter from Jonathan Janz earlier this year—and deeming it not only my favorite horror read of the year, but perhaps of my life thus far—I can easily say he won me over as the kind of reader who will happily pick up anything he writes without hesitation, so I was beyond delighted to pick up this re-release of his debut novel, The Sorrows. Except this building did not look like it could fall. It looked like it would stand forever, far outliving its inhabitants. First, let’s revisit that last statement: this is his first novel, from 2012, and yet what amazes me is that—having read work he’s written this year as well—his writing was just as incredible then as it is now. If that’s not proof that Jonathan has a natural talent for storytelling deep in his bones, I don’t know what is. There was something corruptive here, a palpable sense of depravity. The other thing that amazes me about Jonathan’s writing is how effortless he makes it seem when he scares the hell out of me! I’ve spent years complaining over my seeming inability to find books that genuinely terrified me, with very rare exceptions, but Jonathan’s imagination gets so twisted at times that I just can’t help being frightened. 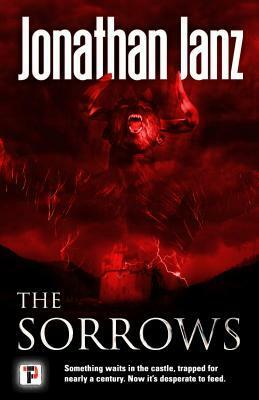 What’s fascinating about The Sorrows in particular is the way the island brings out the inner demons in each person, once again forcing us to ponder which is worse—actual monsters, or the ‘monsters’ humans can become? No, the presence I felt was something totally unfamiliar, and even more disturbing, wholly unfriendly. Finally, he has this way of writing some characters that I can’t help but root for despite their flaws—while other characters in his stories are so fun to hate that I’m left literally cheering when they meet their demise. Ben is an easy protagonist to like, and the feelings he has for his son are so authentic and familiar that it’s easy to see where Jonathan’s love for his own family shone through in the writing here. Even now I wish to live, to experience any emotion, even sorrow. Dear God. I hear something in the hallway. The love interest, Claire, is also very near and dear to my heart. Not only did her entire personality resonate so much with me—her protective nature, the tremendous guilt she feels when facing very difficult decisions, and her struggles with her own appearance—but Jonathan handles the topic of body positivity so flawlessly in her character. I don’t know if I’ve ever seen an adult horror novel shut down fat-shaming so quickly and handle it with such care, and I’m adding it to the long list of reasons Jonathan has earned me as a lifelong supporter. One last thing: this book does tackle a lot of assault-related issues, as well as featuring some on-page assault, so it’s a tough read at times, but those moments are thankfully brief, far between, and handled with care. Though the story was written 6 years ago, there’s even a very Weinstein-esque character who felt tremendously relevant to issues that are being discussed heavily in Hollywood lately, and I thought that representation felt fitting and well-done. As with everything, it’s clear that Jonathan handles each of these sensitive issues with careful hands and good intentions. I cannot get over how enjoyable Jonathan’s work is, and how creepy and artful his stories are. I loved this just as much as I knew I would, and I cannot wait to read more from him. I love the settings he weaves, the characters he creates, and the careful way he treats sensitive topics within his creations. Every horror fan and anyone who is interested in checking out the horror genre, so long as the sensitive content is not too triggering for you. All quotes come from an advance copy and may not match the final release. Thank you so much to Flame Tree Press for providing me with this ARC in exchange for an honest review! Thank you so much, lovely!! That means so much to me to hear you say! Fantastic review and I 100% with everything you said, this book is fantastic and Janz is one of my favorite modern horror authors now! Thank you! Yeah, Janz has definitely become a favorite of mine, too. He’s just so talented and I can’t help but feel like he has a long and illustrious career ahead of him. I read this back many years ago and I loved it. Was my first Janz book!! I so glad to hear you liked it too and glad that they put it back out. He’s so talented and such a kind person too. He absolutely is so talented and kind! I have grown to view him as one of my absolute favorite authors and I’m so glad to have “met” him. I’m so stoked that FTP is re-releasing so much of his older work!